CDM here in the Moog Factory, downtown Asheville, North Carolina. I don’t care whether you’re a Boiler Room fan or hater – this one is special. Erika is here from Detroit with her circular sequencer and loads of gear. The wild and wooly Survive are new to me but they’re doing lovely stuff and have a synth museum worth of keyboard racks – fantastic. And in town from New York, hailing from Oberlin, Ohio, are Teengirl Fantasy. It’s already a great lineup, but novel for a second reason – Moog will keep assembling stuff in the factory as they play. Now that’s what I call Factory Floor (um, also looking forward to that gig this week). Watch online via YouTube now, and hopefully catch the archive if you miss it. 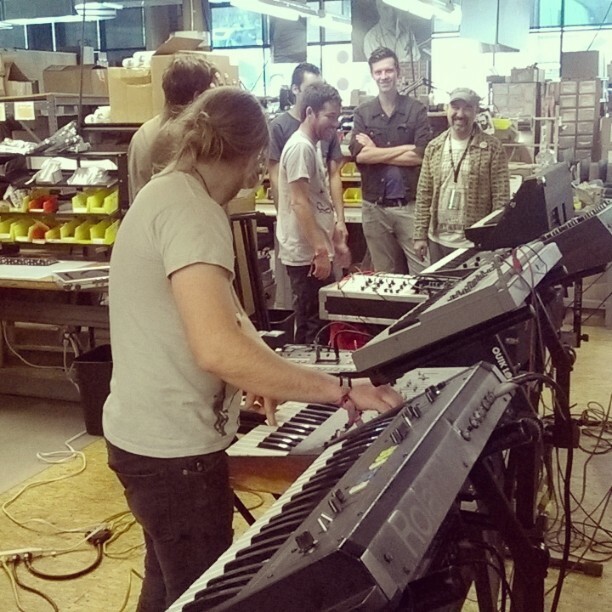 Vintage Roland, ARP, and KORG come to join the party at Moog, as the workers look on. Survive at sound check.